A round-up of all improvements and changes to the Buzz platform in version 2.0.51, available on June 9, 2016. 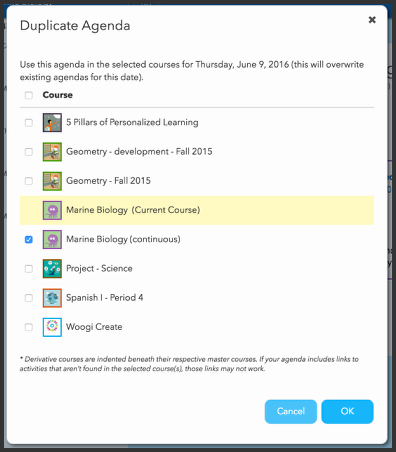 Teachers can now easily duplicate agendas across courses in the same Master/Derivative course chain! ...and select the desired courses. When users insert an image using the rich text editor, they can now choose how the image should be aligned in relationship to the text. 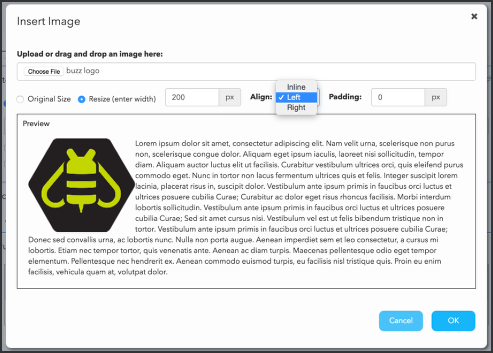 Options include inline with the text, to the left of the text, or to the right of it. Users can also specify the padding they prefer. This is available anywhere you can insert an image using a rich text editor. We've introduced the ability to create and enforce domain-wide password policy requirements. System admins manage this using the Integrations tab in Domain Settings. Learn more. We've improved the Editor's (beta) load times when automated scrolling is required. Resolved login errors for account lockout, password expiration, and subscription limits. [Chrome] Fixed an issue where video recording would not record sound when used in Chrome. Fixed an issue where Buzz would load custom stylesheets (CSS) multiple times, overwriting the components of the stylesheet. Fixed an issue where users could not successfully make a Domian Setting change that removed bookmarks. Fixed an issue where teachers were able to specify activity due dates in a continuous course. Continuos courses shouldn't allow due date specification. Fixed an issue where setting "Display question results:" (Assessment Settings tab) to "Never" would lock all other options as "Always" and give students an error message reading "No questions to display." Fixed an issue where an agenda added to the Calendar tab of the Editor would not display when accessing it through the Admin app. Fixed an issue where the "sets" field would not display when importing objectives using the new Editor. Fixed an issue where drag-and-drop objectives were rejected by items inheriting objectives from a folder. Fixed an issue where the Project Wizard didn't allow new Student Group sets to be added, and projects created with the wizard would not appear in the Editor or Activities tools. Fixed an issue where the "Add Project" dialogue would close without confirmation when a user clicked anywhere outside of the window. Fixed an issue where, when trying to run a Student Report for a selected student with "Student (All Courses)" indicated, a report for the previously selected student would be run with the "Student (Current Course)" setting. 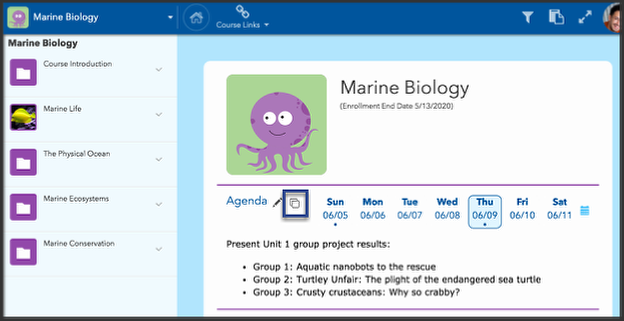 Fixed an issue where a folder's landing page in the Course Home (Activities tool) would display a calendar icon for activities without due dates instead of just displaying them for activities with due dates. Fixed an issue where Digital Library activity searches would return all item types when a specific item type was requested. Fixed an issue where an error would appear if a search returned more than 1000 results. Fixed an issue where blackout dates would not display correctly for teachers assigned only one course. Domain Data, ResetLockout, GetPasswordPolicy: Added a new configuration and commands to enforce a password policy. UpdateUsers: If a user is deactivated while currently logged into Buzz, their session is ended immediately.